This entry was posted in H.264, H.265. Bookmark the permalink. Awesome detailed explanation, Alex! I’ve updated my post to reflect your research. As someone who’s had experience developing video codecs since the early days of MPEG-4, its an easily observed phenomenon that bitrate requirements for a certain level of subjective quality reduce as the spatial and temporal complexity reduce. 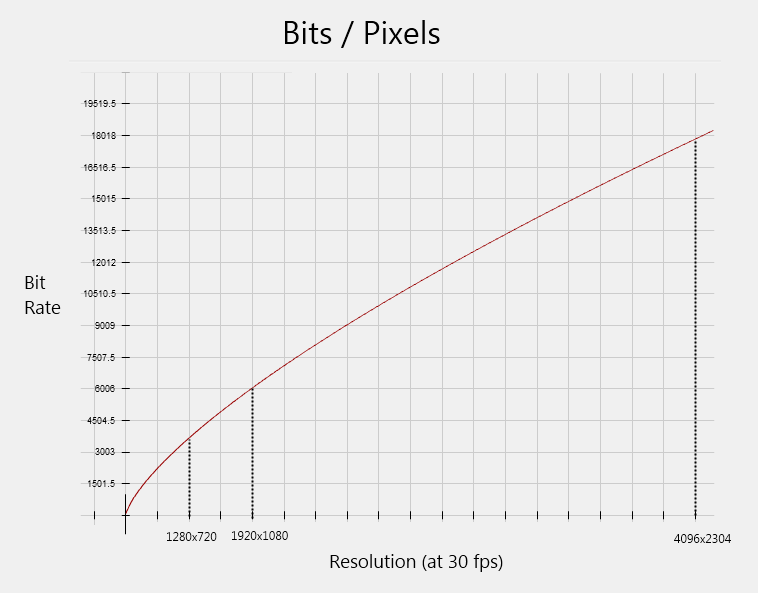 This is why when you double the frame rate (30 to 60fps) the data rate does not have to be doubled for the same quality, and also why if you double the resolution, bitrate does not have to be quadrupled. Basically, increasing the spatial resolution does not increase the spatial complexity at the same rate. But, it is also fair to say that doubling horizontal and vertical resolution (a quadrupling in the pixel rate), would probably require at least a doubling in bitrate. I remember watching this back then, it was the first time I heard of H.264. So they had a software player on the market before Blu-ray or HDDVD hit the market. 3. So what would you deem a good bitrate for 4K video up to 120fps? Assuming this video was going to a disc format that cinephiles/collectors would consider perfectly valid and not complain about? 1. Yes, Blu-ray bitrate averages are actually a little higher than what I posted, and it’s not uncommon these days to find Blu-ray titles encoded at 25-35 Mbps. The 15-20 Mbps I was thinking of is more like a lowest acceptable average bitrate for achieving VQ transparency to the 1080p master. In the early days of HD optical disc encoding many studios tried to save money (and hedge their bets) by encoding movie titles only once and then re-using the same encode for both HD-DVD and Blu-ray. Since HD-DVD discs had less storage capacity than Blu-ray discs, the early encodes ended up being more constrained. Although many people were skeptical early on (I still remember the numerous skeptical AVSForum posts prior to the HD-DVD launch), it turned out that most post-production houses were able to (with some tweaking and re-encoding) deliver nearly transparent VC-1 and H.264 encodes at 15-20 mbps. These days, with everyone encoding for Blu-ray only, such constraints no longer apply so many studios are encoding at 25-35 Mbps simply because they can. Now, the question is: are they getting significantly better VQ at 30 Mbps than at 20 Mbps? Many would argue that the extra bit rate is nice icing on the cake, but not strictly necessary to deliver the desired VQ. 2. Duly noted. Still, I don’t think the iPad deserves that much credit for the advancement of H.264 as Ryan gives it, especially since H.264 adoption was already in full swing by 2010 when it launched. 3. For 120 fps? It’s really hard to say without any real test data available, but I would guess at least 50 Mbps for H.264, and 30 Mbps for H.265. That would, of course, only apply to newly produced 120p 4K content. 4K scans of existing films would still be only 24 fps so such high bit rates wouldn’t be necessary. Thank you for your response. I understand your perspective better now. I think it’s interesting you say 50Mbps for 4K 120fps. If that is in fact true, that’s pretty amazing and we really aren’t too far off from 4K home distribution. At least from a physical media perspective. If there will be physical media to support it.